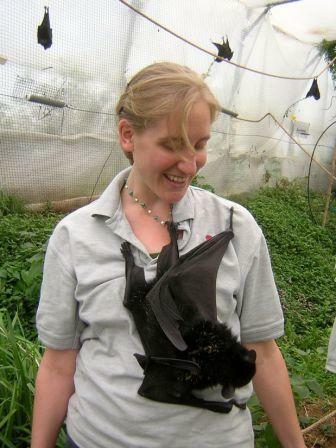 I’ve got news from the bat project to share soon – but today I wanted to share some thoughts about being endangered, and how we think about what that means. The International Union for the Conservation of Nature defines an endangered species as follows: “A taxon is Endangered when it is… facing a very high risk of extinction in the wild in the near future.” The IUCN uses specific criteria to decide whether this applies to a particular species. These criteria include evidence for rarity, population declines and the types and severity of threats, and determine whether a species is globally endangered. The Committee on the Status of Endangered Wildlife in Canada (COSEWIC) has adapted the IUCN criteria for use in assessing species and populations within Canada, and similar processes are followed within each province to determine provincial listings of species at risk. 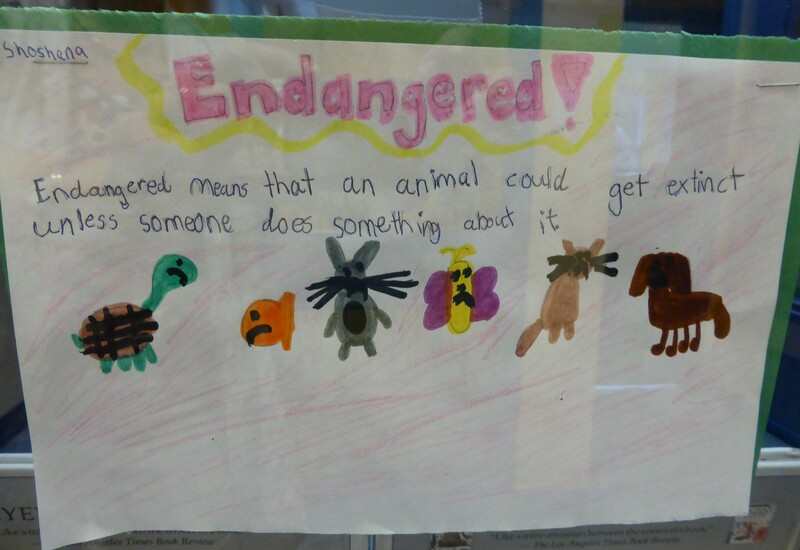 “Endangered means that an animal could get extinct unless someone does something about it”. 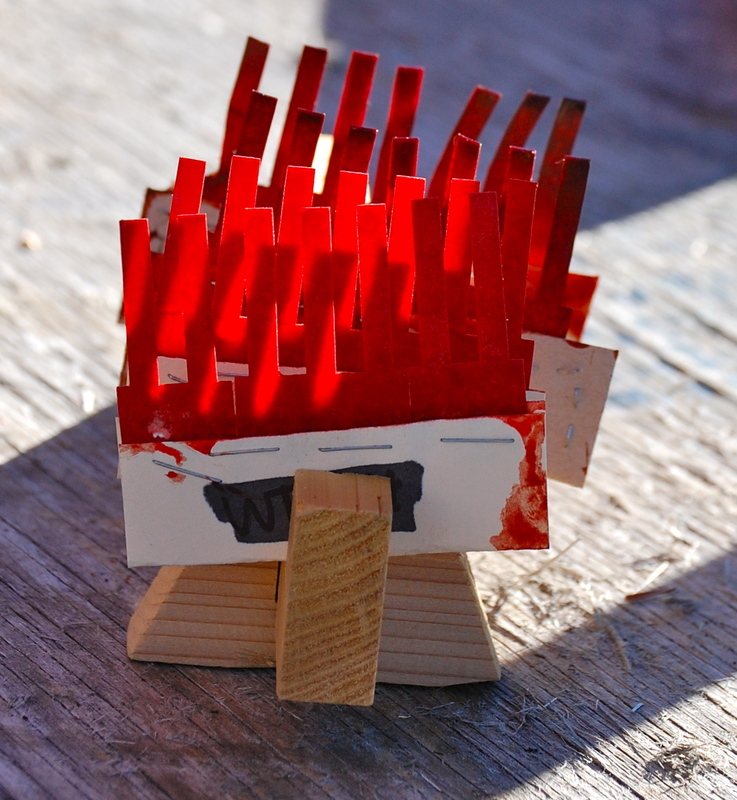 Shoshana – Grade 3 – Sunnybrook School, Toronto. A few weeks ago, I visited a Grade 3 class in Toronto to talk about conservation biology as part of a class unit on Animal Adaptations. The class had been thinking a lot about why adaptations mean, and what happens when the environment to which a species has adapted undergoes a sudden change. We had a great conversation about environmental changes, and about why conservation research is necessary. I love this definition. It captures the point of the IUCN category – endangered means likely to approach extinction – but it also highlights the fact that conservation of biodiversity is a choice. We can choose to let species “get extinct”, or we can choose to “do something about it”. Our own health and survival are tied to preserving biodiversity and functional ecosystems. Maybe we can’t save every species, habitat and wild space out there, but as Shoshana’s definition reminds us, we can choose to try. In a jet boat on the Keele river. I am sneaking through the woods, keeping my voice down and trying to keep up with the hunters in front of me. Suddenly we stop, gesturing and whistling a hunter points and there, in the meadow ahead of us, is a group of caribou. The hunters position themselves, aim for the biggest and fattest animals and several shots ring out. In the end four animals are down, whilst a few escape in the woods. Impressed by the way the hunters navigate the woods, locate the caribou and complete the hunt I follow them as they approach the meadow to begin the arduous task of gutting the caribou and carrying the meat back to camp. This was my first evening on the Tulita community harvest in the Mackenzie Mountains and my very first time in the Canadian North. Autum colours by the Keele river. I joined the Tulita community harvest the last week of September. Tulita is a small community in the Sahtu Settlement region in the Northwest Territories in Canada. The Sahtu Settlement region was formed after the signing of the Sahtu Dene and Metis land claim agreement in 1993, encompassing an area inhabited by the Dene people since time immemorial. Here, a co-management board, the Sahtu Renewable Resource Board, has been established as the main instrument for wildlife management. A bull caribou on the shore of the Keele river. In the Sahtu, caribou and moose are important subsistence resources and an integral part of the economy and traditional way of life. Communal harvests are occasions for large community gatherings on the land where meat and hides can be processed. 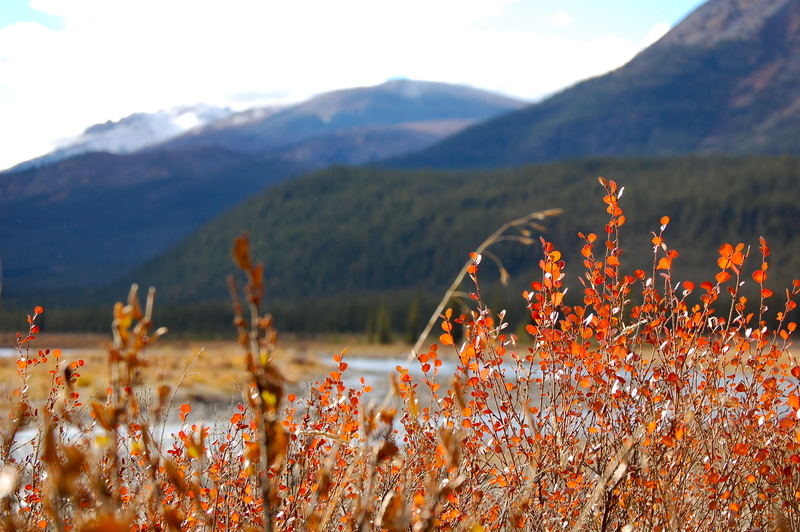 Every year the mountain Dene people (Shúhtagot’ı̨nę) and community members of Tulita travel to the caribou flats ( K’ǝ́yenecho Ɂepę́ Ɂedah ) by the Keele River (Begádeé) in the Mackenzie Mountains (Shúhtagot’ı̨nę Nę́nę́). This is a special place; here the salt licks (Ɂehda) draw mountain sheep (sahzhǫné) and caribou (Ɂepę́) down from the mountains to the valley floor providing ample hunting opportunities during the fall caribou migration. This year I was lucky enough to be invited to join the harvest. I was there to build relationships and engage the community in the wildlife health monitoring program as part of my postdoctoral research. Having only recently arrived in Canada from Sweden, with no experience of working with First Nations communities and only having three days to prepare for the trip I was naturally a bit nervous. However, within a couple of hours of arriving on the caribou flats I have seen my first caribou, and my first kill. I have flown over spectacular mountains, met one of my Liber Ero conservation mentors, toured Norman Wells and Tulita and met the Dene and Metis. Now it was time to see if I could work with hunters to share information on wildlife health and collect some samples. Working together with the Department of Environment and Natural Resources, the Renewable Resource Board and the Renewable Resource Councils in Norman Wells, Fort Good Hope, Tulita, and Deline we are building relationships with hunters in the Sahtu to establish a baseline of health indices for caribou and moose, with the hope of creating a sustainable long-term monitoring program. The Sahtu is currently experiencing unprecedented landscape changes associated with massively increasing exploration and development of shale oil reserves. 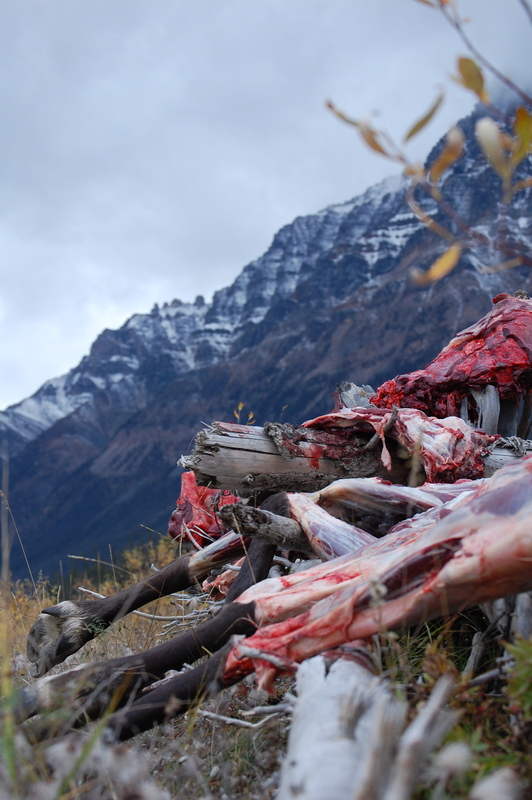 The Sahtu Dene and Metis have clearly voiced their concerns regarding the impacts of this increasing industrial activity on wildlife health and food safety. My project is responding to these concerns, but also serves to provide data critical for assessing the longer term impacts of development on wildlife health. Because if we don’t know what’s happening now, how will we know if it changes in the future? Whilst completing the butchering, caribou meat is laid out on an old log to prevent it from getting dirty in the mud on the shore of the Keele river. That first night, after my arrival at the caribou flats, we were out with a group of younger boys, some who were still learning the most efficient techniques to skin and gut caribou. A couple of days later I had the pleasure of watching elders Jonas Peters and Frank Yallee work, and their level of skill and the speed at which they butcher a caribou is amazing. 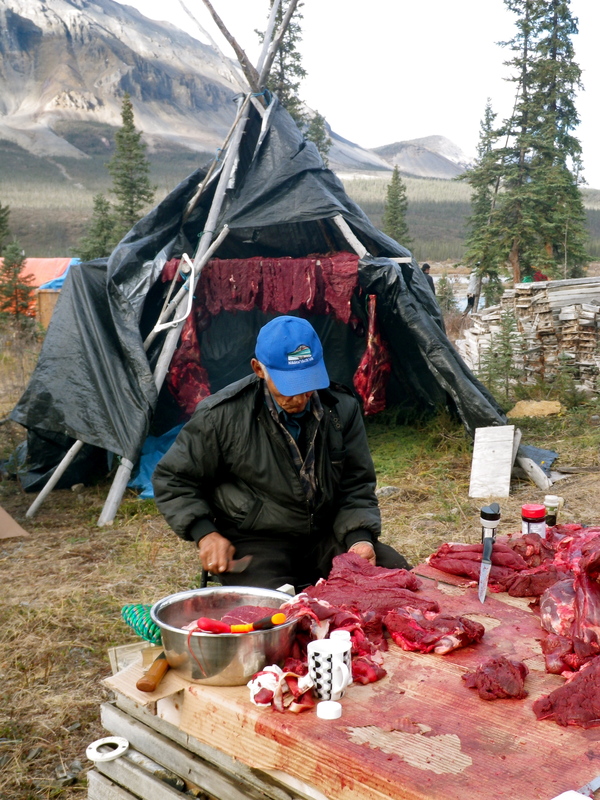 In camp, Kathy teaches me to make dry meat, and explains that the way in which the hunters butcher the animals and cut the meat is really important, if it’s not done in the right way preparing dry meat can be very difficult. Blood samples collected by hunters dry in the sun. The Dene and Metis use every part of the caribou, for food, tools or to make leather for clothes. Even the intestines and hooves are used. We need to make sure we work together with the hunters to identify samples that are easy to collect, that they are willing to sacrifice for science and that yield the most information. For example, the lower left leg can tell us a lot about the animal. We can measure it as an index of body size, we can extract the bone marrow and weight it which will tell us what condition the animal is in, we can check for various parasites such as Besnoitia tarandi, and in the future we will hopefully be able to look at stress levels by examining cortisol concentration in the hair. After a few days at the camp I reflect over what Susan Kutz, my supervisor at the University of Calgary, told me before I left: “Forget anything you know about camping, this is not camping like you have ever seen it before” and I realised this was good advice. My first indication that this was not going to be your usual lightweight camping trip came whilst watching the pilots loading up the confined space of the twin otter plane. There was a lot of food and equipment, all needed to support the 10 day long community gathering in the mountains. The hunters were already at the camp, as they left for their two day jet boat journey up the Keele river a few days before. In addition to transporting equipment, the plane was also chartered to bring the elders and high school students to the camping ground and to bring back meat from harvested caribou for the rest of the community. Caribou meat is carefully cut to make dry meat, which is hung up on a rack to dry above the fire. Apart from being an unusually comfortable camping experience, my time spent by the Keele river also clearly highlighted the meeting of the modern culture with the traditional ways of life, two worlds that the Dene and Metis are continuing to integrate. For example, whilst Ricky Andrew shows us how to prepare a moose hide, removing all the hair to make leather, some of the high school students arrive with the ATV to help the hunters move the meat from the butchered moose to the camp. At camp several tents have been set up to dry and smoke the meat to keep it from going bad, and as I learn the painstaking process of making dry meat by butterflying it out into thin, thin sections a girl fiddles with her phone to find a good song and the generator powering the freezers hums in the background. Here all generations work and learn together to harvest and prepare food to live on the land. Looking back at my first trip to the North I am still stunned at the beauty of the landscape and the close connection between the land, the people and the animals. For me this was probably the best introduction to my postdoctoral project I could ever have wished for. Not only did it give me an opportunity to meet and engage with key members of the Sahtu community but it gave me a better understanding of the integral role caribou and moose play in the lives of Sahtu people. 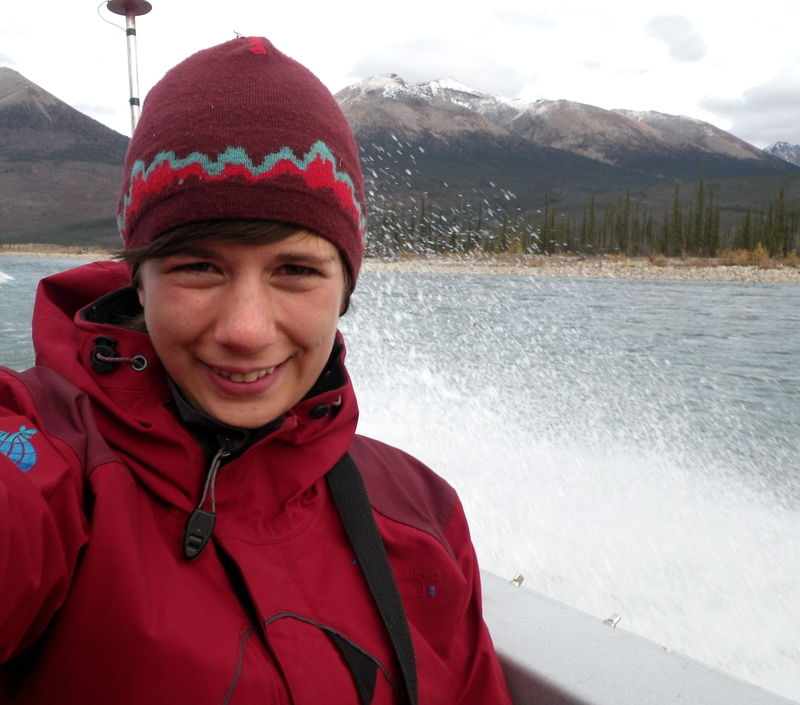 In this blog I will continue to write about my adventures in the North, the progress of my research and how I cope with my first Canadian winter! 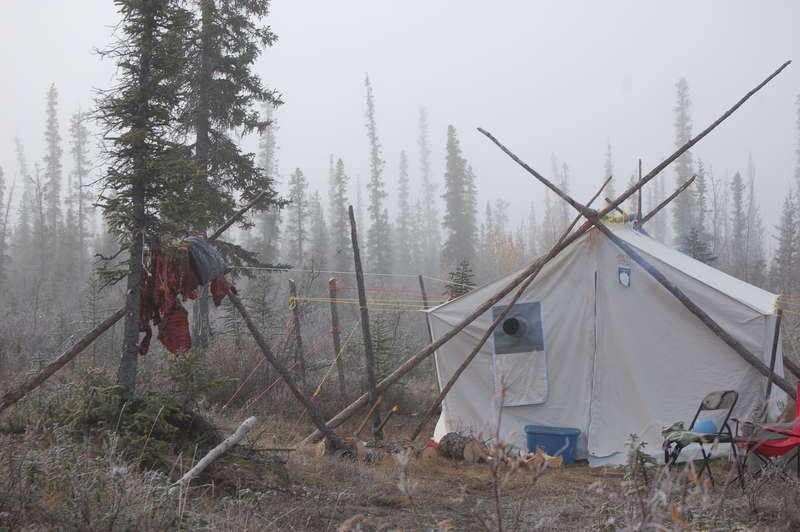 Caribou meat hanging outside of Tulı́t’a elders Frank Yallee and Jonas Peters tent in camp by the Keele river in the Mackenzie mountains on one of the few chilly, misty mornings.